Ribes rubrum var. scandicum Jancz. Ribes rubrum var. sylvestre DC. ex Berland. Ribes spicatum subsp. scandicum Hyl. 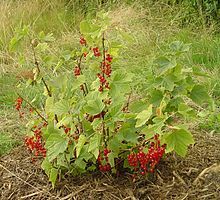 The wineberry (Ribes rubrum) is a member o the genus Ribes in the guissberry faimily. It is native tae pairts o wastren Europe (Belgium, Great Breetain, Fraunce, Norawa, Swaden, Germany, Netherlands, northren Italy, northren Spain, Portugal, Poland, an Croatie). The species is widely cultivatit an haes escaped intae the wild in mony regions. ↑ The Plant List, Ribes rubrum L.